ATLANTA -- Georgia authorities believe up to four people have died and dozens more have become ill in the central part of the state after overdosing on an unknown street drug. Georgia health officials say it's the largest cluster of opioid overdoses in state history, CBS News' correspondent Mark Strassmann reports. One state health official told Strassmann that doctors now have at least seven overdose patients on ventilators. Officials said Tuesday that they were awaiting tests to confirm the cause of the deaths and overdoses. But local officials said several people told doctors and nurses that they became ill after swallowing yellow pills purchased on the street. The Bibb County coroner, Leon Jones, identified two of the people who died of overdoses as 36-year-old Amirrah Gillens and 52-year-old Gregory Mitchell, CBS affiliate WMAZ-TV in Macon reports. Gillens died Sunday and Mitchell died Tuesday morning. Emergency workers responded to the numerous reports of overdoses in Centerville, Perry, Warner Robins and Albany in about 48 hours, authorities said. 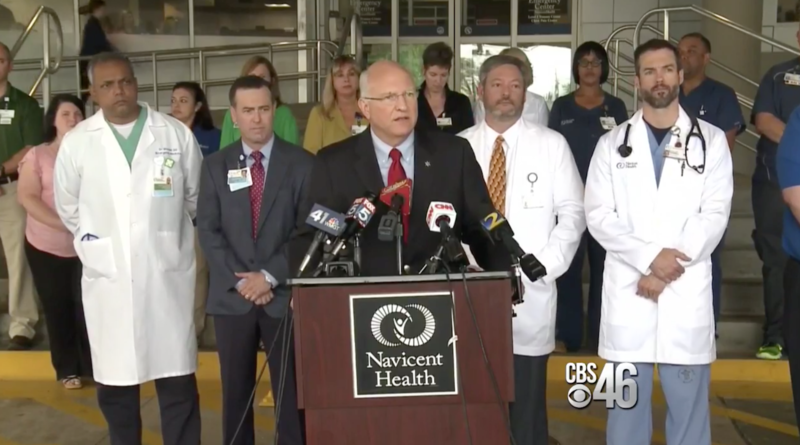 Reports of overdoses continued coming in on Tuesday, clustered at three emergency departments in Bibb County and some surrounding counties in the past two days, said Chris Hendry, chief medical officer at Navicent Health in Macon. "There is a new drug that's surfaced in our community," Hendry said during a Tuesday afternoon news conference. Bibb County Sheriff David Davis on Tuesday invited "anyone who has a drug problem" or who normally takes illegal drugs to come forward, promising that authorities were willing to forgo any criminal charges in favor of information leading to an arrest. "We need to know who is putting this poison in the community," Davis said. Most patients arrived at hospitals unconscious and several needed medical equipment to breathe and "aggressive" doses of overdose-reversing drugs, said Dr. Gaylord Lopez, director of the Georgia Poison Center. WMAZ reports the opioid antidote Narcan, also known as naloxone, was being used to counteract the effects of the unknown drug. Some of the affected people told nurses and doctors that they swallowed just one pill before becoming ill.
Lopez said Navicent Health first contacted the poison center late Monday night after treating five people -- all from the same household -- for overdoses. "Right there, there seemed to be something wrong with that picture, that all five came from a particular household and there were patients ranging from 20- to 60-year-olds in that group," he said. State officials then began contacting other hospitals in the region and learned of additional overdoses. Lopez said one reported overdose further south in the city of Albany may be caused by the same drug. The drug, which is being sold on the streets as a pain medication called Percocet, can cause people to lose consciousness and experience severe respiratory failure, Hendry said. But the actual substance causing overdoses remained unknown on Tuesday. Last month, the Georgia Bureau of Investigation's crime lab began studying counterfeit pills and found more than 450 that contained fentanyl and other dangerous drugs but were being sold on the street as pharmaceuticals, spokeswoman Nelly Miles said. According to the Centers for Disease Control, about 1,300 people fatally overdosed on drugs in Georgia last year. State officials acknowledged Tuesday that narrowing down an exact cause for the deaths and overdoses in middle Georgia could be difficult. Patient tests don't always reveal the cause of overdoses and it's difficult to test for newer synthetic drugs, said Dr. Laura Edison, a medical epidemiologist with the state Department of Public Health. So far, police haven't found a pill similar to those described by sickened people. Police and other agencies asked anyone who finds a similar drug to call law enforcement and avoid touching it in the meantime.